Meet Dr. Malidoma Somé, Phd. For more than twenty years, Elder Malidoma has shared the Wisdom of his Ancestors and tribal Elders: the Dagara Cosmology, and awakened a deep knowing in the hearts and bones of those who have recognized in his name, his books, his voice, and the Spirit world inviting the renewal of a deep and abiding relationship with all beings on Earth. 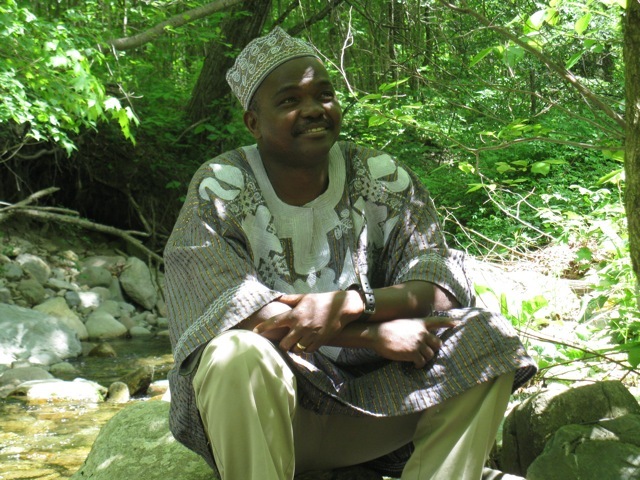 Elder Malidoma is the author of several books, including Ritual: Power, Healing and Community, Of Water and The Spirit: Ritual, Magic and Initiation in the Life of an African Shaman, and The Healing Wisdom of Africa: Finding Life Purpose through Nature, Ritual, and Community. Dr. Somé holds three Master’s degrees and two Doctorates from the Sorbonne and Brandeis University. He is an initiated elder in his village in Dano, Burkina Faso, W. Africa. He travels throughout the world bringing a message of hope, healing and reconciliation through the powerful tools of ritual and community building. The programs detailed here are some of those most often requested when Malidoma’s teaching and facilitation are invited into a community. Malidoma’s indigenous wisdom is equally applicable to individuals, families, communities and corporate organizations, and we look forward to opportunities for collaborative enterprises committed to manifesting the visions that the spirit world is calling forth. If you are considering inviting Malidoma to be a keynote speaker, workshop leader, retreat facilitator and/or trainer, please contact the office for further information and support. The calendar of events features events and appearances by Malidoma. Please consider subscribing to our monthly E-Village News, this is an inspiring and convenient way to stay updated about Malidoma’s teachings and travels. Contact us to learn more about Malidoma’s events worldwide. We also welcome your inquiries about having Malidoma come to your part of the world to bring his message of inspiration, direction, purpose. Please be aware that dates, times and locations on the calendar may be updated periodically.